We have a sliding rate that depends on how many people are renting the house. Contact us for specific quotes as weekly or special discounts may apply. Higher rates may apply for holidays and special events. Rates are subject to change without notice. 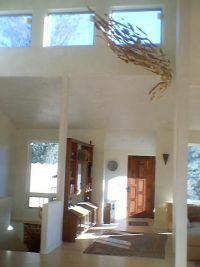 Average rates for Agave House are $230 per night for up to two persons plus $15 per night for each additional person. 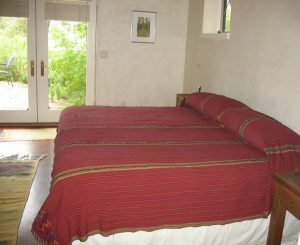 Average rates for Raven House are $180 per night for up to two persons plus $15 per night for each addition person. For every rental there is an additional cleaning fee of $150 and a refundable damage deposit of $300 required. We can negotiate lower rates for long-term guests on sabbatical or looking for a house in our area. We have also accommodated seminars and spiritual retreats. As a wilderness area retreat, Agave Ridge is not an ideal place for pets. We suggest that you use our free pets–foxes, lizards, skunks, hummingbirds, javelinas, and deer–although we can accommodate well-behaved dogs for an extra fee. We are not responsible for your pet’s safety. Please tell us about pets in advance. We occasionally get snow in our area. The scenery is spectacular when it snows, but access may require a four-wheel-drive vehicle. Call us about rates and conditions. We accept payment with cash, money order, personal/business check, or credit cards. To hold a reservation, 50% of the rental fee is required with the balance due 15 days before the arrival date. Cancellations 60 days prior to first day of reservation will receive a full refund (less a small processing fee if you paid by credit card). Availability for both Agave House and Raven House is shown below. “The peace and quiet was great. If you are looking to relax and enjoy the mountains this one fits the bill. “ Dale R.